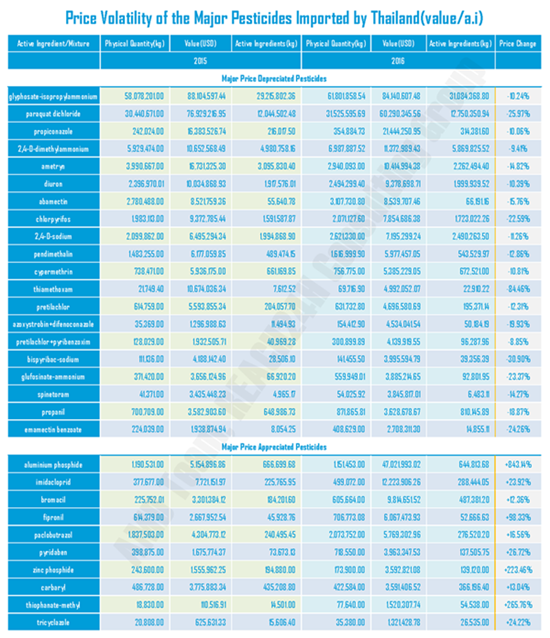 By the end of 2016, Thai agricultural pesticide importation totaled 160,687 tons, representing an increase of 10.8% compared with the previous year of 149,458 tons. Import value grew by 7.1% to 20.577 billion THB (587.91 million USD at the current rate). The number of Thai companies engaged in pesticide importation decreased from 147 to 141 while the number of sourcing origins went from 34 in 2015 to 36 in 2016. The number of imported active ingredients/combinations showed little variation however prices were volatile during the year. Herbicide was the most imported product category, followed by fungicide and insecticide. 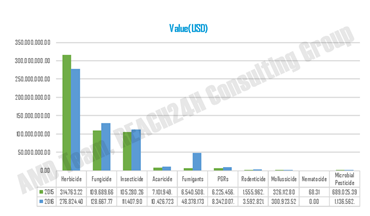 The volume of herbicide grew by 4.7% however the value dropped by over 12% to 276.8 million USD. 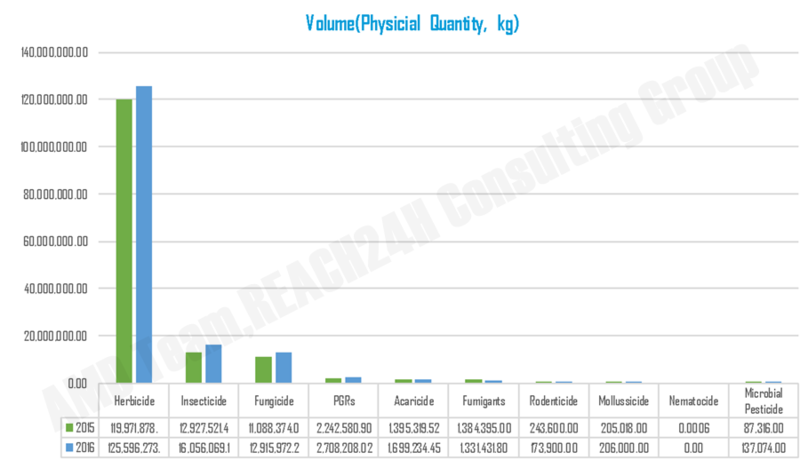 The value of insecticide imports increased by 5.6% to 111.4 million USD however the increase in volume was below average growth. 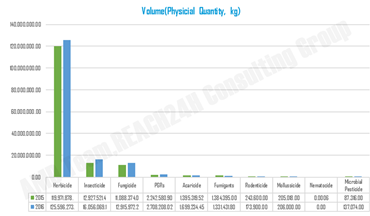 The importation of fungicide increased by over 16% in both volume and value terms. 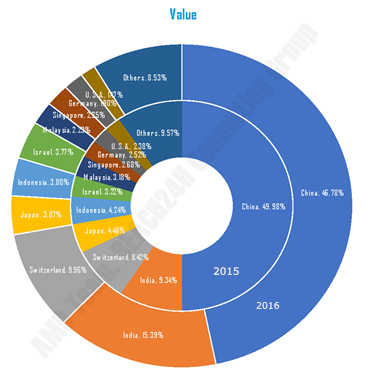 Despite a slight decline in importation volume, fumigant imports were valued at 24.38 million USD representing an eightfold increase (year-on-year). Rodenticide dropped by almost 30% in volume but doubled in value. 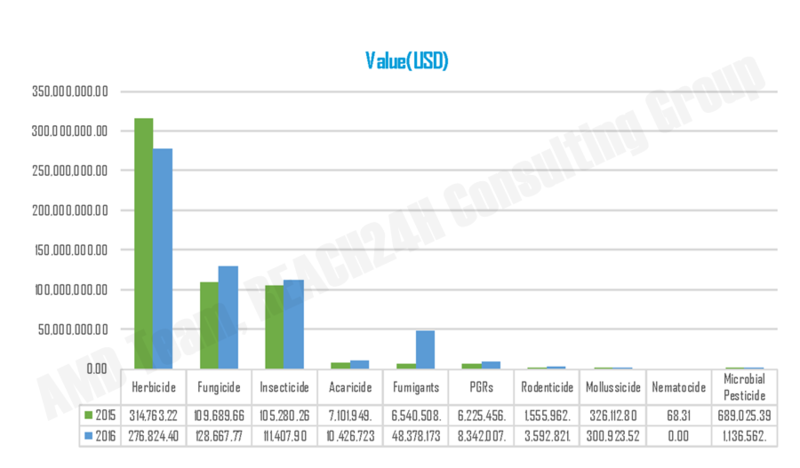 The value growth of acaricide was 46.7%, which is higher than the volume growth of 22%. It is noteworthy that the most sustainable growth came from microbial pesticides, which have grown over 50% in both volume and value terms. 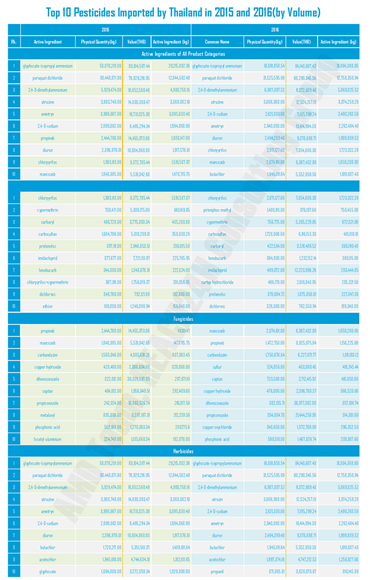 Thailand imported pesticides from 36 countries/regions in 2016. Most of the importation came from China, followed by India and Swizerland. 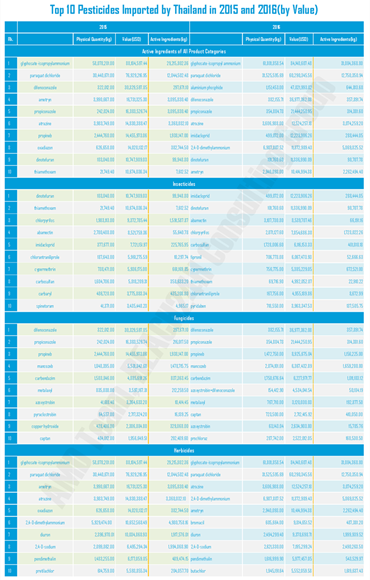 The top 10 soucing orgins accounted for 90% of the total importation in both volume and value terms. Importation from China increased by 12.7% to 124,906 tons but the value was a little lower than the pervious year. Imporation value for indian imports soared by 75%. Swiss import value increased by 36%, which diluted China’s import value market percentage. Indian import volume was steady at around 8.6%. Importation from indonesia grew by 60% in volume and 27% in value. Importation from other major origins was relatively low. US imports decreased by 30% in both volume and value. 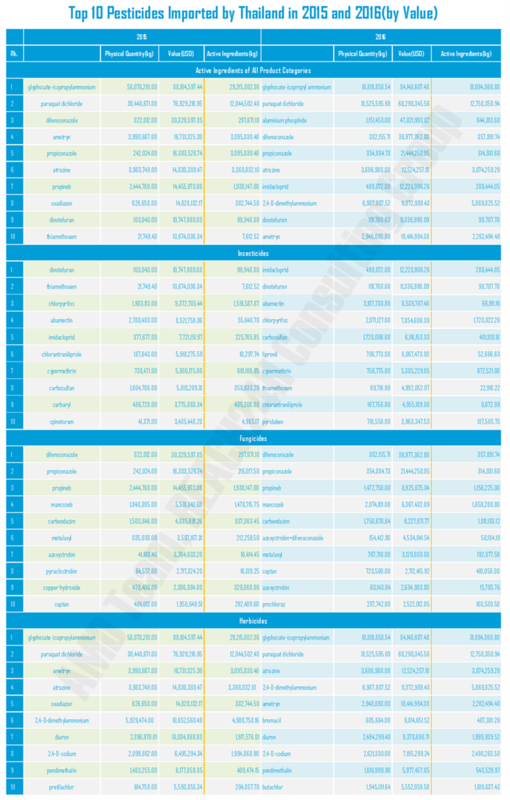 Average prices of Glyphosate-isopropyl ammonium and paraquat dichloride have dropped by over 10% from the beginning of the year, these herbicides however remained the top imported pesticides in both volume and value terms. Thanks to steady volume and price, aluminum phosphide became the third most valuable pesticide. 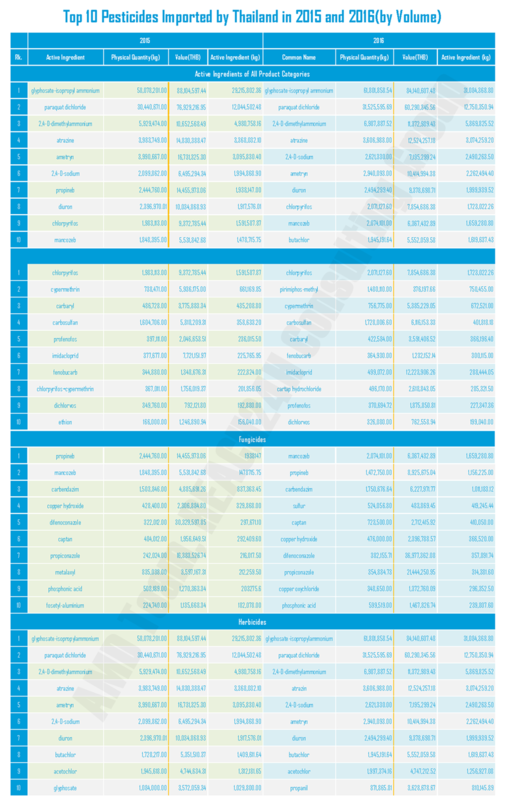 Of all the 207 pesticides imported in both 2015 and 2016, only a few of them achieved substantial price appreciation: aluminium phosphide, imidacloprid, bromacil, fipronil, paclobutrazol, pyridaben, zinc phosphide, carbaryl, thiophanate-methyl and tricyclazole. 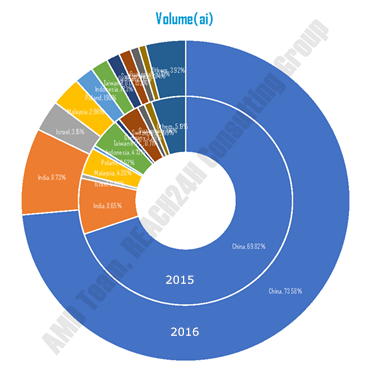 Among the 124 pesticides which experienced a decrease in value, the most significant decreases were: propiconazole, 2,4-D-dimethylammonium, ametryn, diuron, abamectin, chlorpyrifos, 2,4-D-sodium, pendimethalin, cypermethrin, thiamethoxam, pretilachlor and bispyribac-sodium.